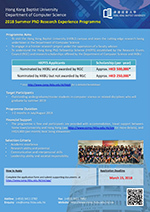 understand the Hong Kong PhD Fellowship Scheme (HKPFS) established by the Research Grants Council (RGC) and research scholarships offered by the Department of Computer Science and HKBU. The programme is free. Successful applicants will be required to arrange their own: 1) entry permit to Hong Kong; and 2) round-trip transportation between home country and Hong Kong. For enquiry, please contact Ms. Kristina Tsang.